Commentators often complain about a supposed abundance of tacked on multiplayer modes, but new research conducted by EEDAR has found that console game publishers have significantly shifted away from online support since the start of the current generation. 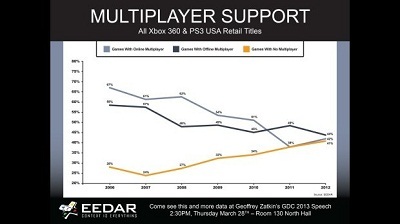 In a new report focused on multiplayer support in Xbox 360 and PS3 games released in the US, EEDAR chief operating officer Geoffrey Zatkin said (via Penny Arcade): “You can see that in 2006, one year into the release of the Xbox 360 and the launch year of the PlayStation 3, 67% of the games had online multiplayer, 58% had offline multiplayer and 28% had no multiplayer. 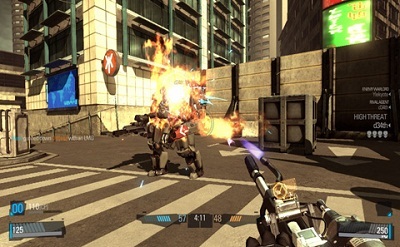 The inclusion of multiplayer features is costly and is not guaranteed to improve sales unless it’s a core part of the experience or executed to the highest of standards, Zatkin suggested. “Multiplayer, when executed well, can be the heart of the game and is often what keeps people playing for extended periods of time,” he said. “Best-in-class multiplayer, such Call of Duty, Halo, Madden, FIFA, League of Legends, World of Warcraft, etc. is awesome. A lot of the success of these games, both individual titles and franchises, is a result of their superior multiplayer execution. “Including multiplayer for the sake of having multiplayer doesn’t make sense,” Zatkin reasoned, asking whether online support for the likes of BioShock Infinite, Batman Arkham City, Skyrim or Heavy Rain would have improved the experience.